Make sure that your working surface is such that you can sit comfortably upright whilst working, so that your back is not curled up, nor your shoulders hunched. If your shoulders start to get stiff or you feel a burning sensation, stop working, walk around the room and try to adjust your posture when you return to the keyboard. Your arms and wrists. In order to avoid Repetitive Strain Injury (RSI) it is important to keep your wrists as flat as possible, so that the tendons that go through the carpal tunnel are not working round a corner. 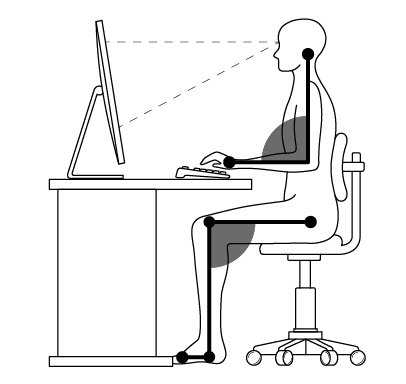 In order to achieve this it may be necessary to adjust the height of your keyboard, and/or provide support for your wrists. Finger action. Your hands should be held in a relaxed manner over the keyboard with the fingers gently curved downwards and the wrists straight. There is no need to hit the keys hard, a very gentle touch is all that is necessary. Position of the monitor. The monitor should be straight in front of you and at a height which allows you to view it without having to hold your head and neck in an unnatural position. Looking up at a monitor all the time can give you a stiff neck and headache. You may need special glasses to work for a long time at the computer, especially if you usually wear glasses or are long sighted. Avoiding strain. At regular intervals, and at the end of every module, hang your hands down at your sides and shake your hands about in a relaxed manner. Then grasp your forearms and massage them gently before going on to the next module. If you get pain, tingling, pins­and­needles or numbness in your hands or wrists, stop typing and rest. Try changing how you sit and work to avoid any more strain. Short sessions. Do not work at the computer for long periods of time. Short frequent sessions are better.